Bulk Desk Pad Calendars, customized with your imprint at bargain prices. Our economy desk pad calendars are available in many colors. heavy cardboard placed in the back of the item in a reinforced pocket to keep the item stiff. 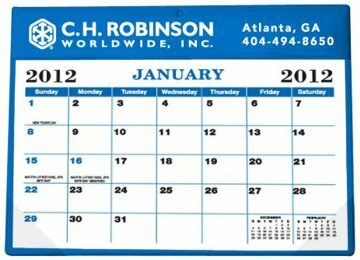 Contact us if you need a rush delivery of our personalized desk pad calendar. Free artwork design. Lowest prices in USA and Canada for bulk promotional desk calendar pads. Unit Prices below include your 1-color custom imprint. For custom imprint in full color, please add $1.00 per desk pad calendar. Setup Charge: $41.25 per ORDER. Item Size 11-1/2" x 8-3/4"
Packaging: 50 units per carton of 22 lbs. Imprint Location Centered on header area. Imprint Size : 11-1/2" x 2"